One day in late 1906, seventy-one-year-old Mark Twain attended a meeting on copyright law at the Library of Congress. The arrival of the famous author caused the usual stir—but then Twain took off his overcoat to reveal a "snow-white" tailored suit and scandalized the room. His shocking outfit appalled and delighted his contemporaries, but far more than that, as Pulitzer Prize finalist Michael Shelden shows in this wonderful new biography, Twain had brilliantly staged this act of showmanship to cement his image, and his personal legend, in the public's imagination. That afternoon in Washington, less than four years before his death, marked the beginning of a vibrant, tumultuous period in Twain's life that would shape much of the now-famous image by which he has come to be known—America's indomitable icon, the Man in White. Although Mark Twain has long been one of our most beloved literary figures—Time magazine has declared him "our original superstar"—his final years have been largely misunderstood. Despite family tragedies, Twain's last half- decade was among the most dynamic periods in the author's life. With the spirit and vigor of a man fifty years younger, he continued to stir up trouble, perfecting his skill for living large. Writing ceaselessly and always ready with one of his legendary quips, Twain would risk his fortune, become the willing victim of a lost-at-sea hoax, and pick fights with King Leopold of Belgium and Mary Baker Eddy. Drawing on a number of unpublished sources, including Twain's own journals, letters, and a revealing four-hundred-page personal account kept under wraps for decades (and still yet to be published), Mark Twain: Man in White brings the legendary author's twilight years vividly to life, offering surprising insights, including an intimate, tender look at his family life. 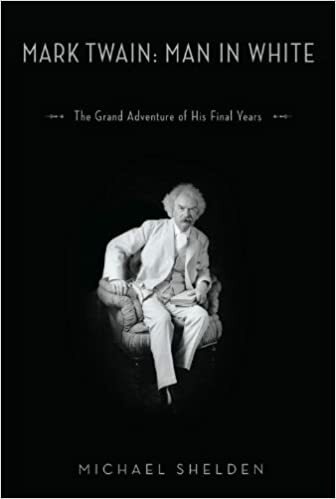 Filled with first-rate scholarship, rare and never-published Twain photos, delightful anecdotes, and memorable quotes, including numerous recovered Twainisms, this definitive biography of Twain's last years provides a remarkable portrait of the man himself and of the unforgettable era in American letters that, in many ways, he helped to create.